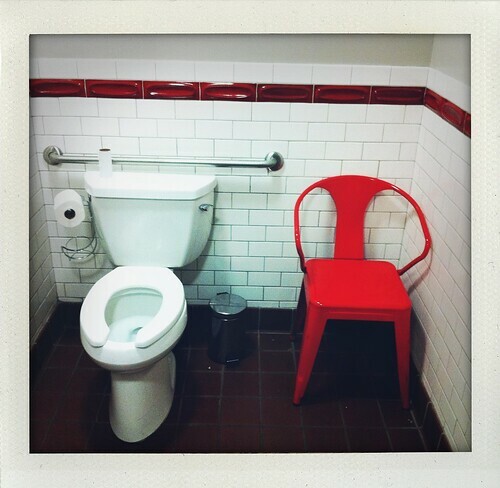 At Homeroom last night, I noticed this chair in the bathroom. Now, Homeroom isn't alone here. I've seen random chairs in other bathrooms. And I have to ask, "Why?" When I'm in the bathroom, I neither want an audience nor need help. Neither am I typically so exhausted afterward that I need to sit down and rest. Perhaps I'm unusual, though. What do you guys think? I think it is so that there is a dry surface on which to place any personal items you've been carrying. Especially lovely for a purse or shopping bags. I have not always loved sarcasm. One of the bitterest experiences in my childhood from which I haven’t got out yet was being hurt by “sarcasm”. I found it so mean, so cruel. I wondered why it was done mercilessly to this innocent child, this little angel who would rather die than hurt a fly! “How could people be so mean? How is it all even possible?” were the most painful, mind numbing questions which tortured me day in and day out. Rational inquiries of moral philosophers were confined to politically correct, “mushy” virtues like unconditional love, kindness, compassion and benevolence. Even moral philosophers who took pride in their political incorrectness had confined their rigorous analysis to more worthy virtues like integrity, honesty, justice, productiveness, pride and of course, selfishness. Very few have anything good to say on one of the most feared, despised, sickening, malevolent, humiliating form of doublespeak which makes people flee and shun the light of the day: sarcasm. A bit of iconoclasm is therefore in order. There was a shelf built into our dorm room shower stalls that looked like a bench. We called it the observation deck. That came immediately to mind when I saw this. Graeme, I think you're absolutely right. Perhaps they're preparing for the Folsom Street Fair?